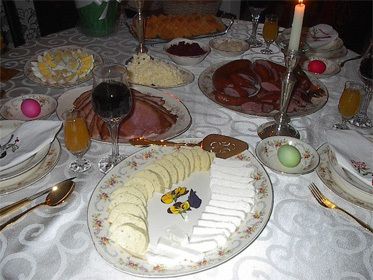 Cap'n Ron's: My Memories of a Polish Easter. My memories of Easter Sunday begin 6 weeks in advance of Easter, when we would begin making Pysanki. Pysanki are Russian Easter eggs that are raw (for deeper colors), and are drawn on with a stylus containing hot wax to get a design. You begin with white, then begin to dye, starting with the light colors and progressively getting to the deeper shades. The wax keeps the egg from absorbing the color, so anything you coat with wax will not take the next color. I work on 2 at a time, and it takes 3 - 4 hours to finish 2 eggs. After they're made, most are given away, but the best are saved for the Easter Table. The weekend before Easter Sunday, we made the White (Farmers) Cheese. During the week we'll go to the Polish Butcher to pick up the Kielbasy, and pick up the rest of the ingredients for Sunday's Feast. Some time during the week we'll also make up the Butter Lamb, Horseradish and Beets, and the Egg Cheese. We've also made enough of the Pysanki by this time, and begin decorating boiled eggs with the head of a pin. To do this, you begin by sticking a pin in the end of a long wooden kitchen match (the match becomes the handle). Next you take a metal jar top, put some beeswax in it, then place this in a small frying pan over a very low heat to melt the wax. The technique, is to begin with a Hard Boiled egg, then you touch the head of the pin in the hot max, and immediately touch it to the egg and draw. You do this so that you make little teardrops. These are formed into small a starburst pattern, with the larger end on the outside. We'll eat these on Easter morning, and I'll try to get a picture up before Easter. Friday night the bread was baked, so that it could be ready for the Blessing of the Food on Saturday. Saturday the food would be brought to our Church to be blessed, including the uncooked Kielbasy, Ham, Salt, and Pepper. It's always brought in a basket that is lined wth, then covered with a linen napkin. Of course 1 or 2 of the Pysanki are always given away at this time, but only to someone that would really appreciate the gift. We would stay up late, to attend Midnight Mass. This is almost a must, due to the fact that there's always a lot of work on Easter Sunday preparing the Brunch. Easter Sunday morning. we would get up in great anticipation of an Easter Basket being on the Dining Room Table. Of course there would be, and it would have Chocolate Easter Bunnies and Eggs, and Jelly Beans. We might also find a little cash stuffed within the plastic green grass. I may be showing my vintage, but a couple of quarters or a dollar bill was a big time score, especially since my allowance was only $ .50 a week, and I had to work for that. By this time my Mom would already have started the Ham, then the Kielbasy and the Kielbasy Soup. As I grew old enough, the Easter Basket became something for my Brother's and my children, and the Scarlet O'Hara's became one of the "treats" we looked forward to. Prior to our company showing up at around 11:00 AM the first batch of Scarlet O'Hara's would be mixed, so that they could sampled, Our excuse for this "testing" was to insure that they would be "fit" for company. Our guests would arrive, drinks would be passed, and a beeswax candle would be lit (this was the same candle that my Mom had on her table growing up, and would also be used for Christmas Eve), Grace would be said, and we would continue with a toast, then the soup, and the rest of the feast. We were always too full afterwards for dessert, but a few hours later, my Mom would bring out coffee and a White Cake with White Fluffy Icing that would be decorated with coconut and jelly beans. She eventually changed this and would place a small ring of waxed paper in the center, then fresh pansies on top before covering the rest of the cake with the coconut.